Don’t we all need a cheerleader friend like that? I suspect I’m not the only one struggling most days. 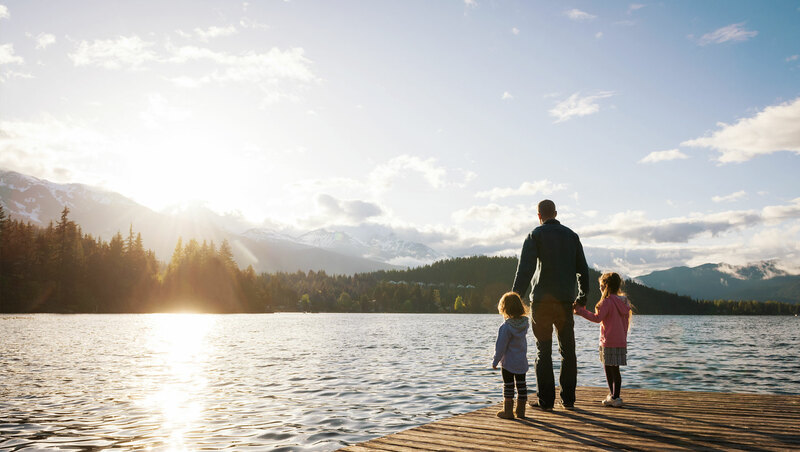 Marriage is sweet, but the seasons can be hard between the demands of work, home, and offspring. We are investing in our children, but this doesn’t net what we expect at the rate we expect. We daily disappoint ourselves as we struggle with our own sin and the weaknesses, spiritual and physical. We love our children dearly, but my goodness, sometimes we want to send them to China! (I wonder where Chinese parents threaten to send their children?). I don’t want to sound pessimistic, but neither do I want to ignore the fact that it is incredibly hard to live with and raise people who are just as sinful as we are. Not being honest about this does not serve each other, or the next generation of moms and wives, well. What if we women could be both completely realistic and completely optimistic about our role--at the same time? What if our relationships with other women began to paint a beautiful picture of the grace of God? 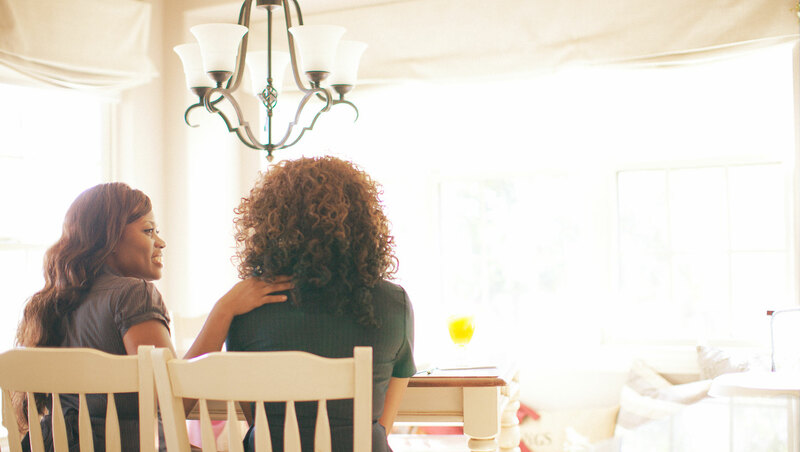 What if we became skilled in connecting the dots of what we know from God’s Word to the everyday pain points of motherhood and marriage? What if we became wells of encouragement for each other in this soul-sanding work of motherhood? Accept her as God accepts her and be patient with what God is doing in her life, as patient as God is with you. Be a safe person she can talk to. There is a lightness that comes to relationships when we don’t feel the need to fix someone, but can entrust that responsibility to the Creator. “Therefore welcome one another as Christ has welcomed you, for the glory of God” (Romans 15:7 ESV). “I therefore, a prisoner for the Lord, urge you to walk in a manner worthy of the calling to which you have been called, with all humility and gentleness, with patience, bearing with one another in love” (Romans 4:1-2). Remind her of all the good God’s grace is doing in her life already. If her faith is in Jesus, even on her worst days and through the wackiest situations, God is doing something good in her. When her weaknesses are exposed and she throws herself on God’s strength and mercy, her children learn to do the same. As my friend and I like to say, “If you’re not modeling good character, model repentance.” “And I am sure of this, that he who began a good work in you will bring it to completion at the day of Jesus Christ” (Philippians 1:6). Pray for her and with her. Ask God to lead you in praying for her. Pray Scripture for her and jot her a note letting her know how you’re praying. “Therefore, confess your sins to one another and pray for one another, that you may be healed. The prayer of a righteous person has great power as it is working” (James 5:16). As you listen to her, ask the Lord how she might be encouraged in the Gospel. Does she need to be reminded that she’s forgiven? Does she need to be encouraged that God is doing something good, even in this crazy situation? Does she need to recognize what is her burden and what is God’s? Does she need to be reminded that God is control of this situation? Speak as gently as the LORD speaks to you. “The Lord God has given me the tongue of those who are taught, that I may know how to sustain with a word him who is weary. Morning by morning he awakens; he awakens my ear to hear as those who are taught” (Isaiah 50:4). Help her see God’s true character and the way He sees her. I think so often the way we imagine God is not in line with His Word. We imagine Him looking at us disapprovingly at our repeated failure and slow growth, and forget that we don’t exhaust His patience. We imagine Him distant and busy, when He is really present and attentive. “You, O Lord, are a God merciful and gracious, slow to anger and abounding in steadfast love and faithfulness” (Psalm 86:15). Remind her that motherhood (and even marriage) is a long-term investment, the success of which can’t be gauged by the current results. Remember how scrawny your bean plants look at the beginning of spring, and how sprawling and wild they become at the end of summer? Plants grow into what they were intended to be, just as your children and your husband are growing into what God has intended them to be--in His timing. The weight of how they ultimately turn out is not ours to carry. “And let us not grow weary of doing good, for in due season we will reap, if we do not give up” (Galatians 6:9). Point her to the One who can sustain, comfort, fill, heal, counsel, and transform. Our job isn’t to fix our friend’s situations, and good advice can only go so far. Remind her that the Holy Spirit is close. Remind her that it’s okay that she can’t fix things. It’s okay to give up to God what she can’t bear herself. “Come to me, all who labor and are heavy laden, and I will give you rest” (Matthew 11:28). Be honest with your own struggles so she knows she’s not alone. When we don’t share our real struggles, we create a self-perpetuating cycle of shame and lack of community. She must have it together so I don’t dare admit that I don’t have it together. But because of our confidence in God’s grace for us, we can be bold with our weaknesses. Instead of sending the message, “Look at what I’m capable of,” we can say: “Look at what Jesus can do in my weaknesses.” “But he said to me, “My grace is sufficient for you, for my power is made perfect in weakness.” Therefore I will boast all the more gladly of my weaknesses, so that the power of Christ may rest upon me” (2 Corinthians 12:9). Be there. Never underestimate the power of your presence and your willingness to show up. After all, the Spirit of the living Christ lives in believers, and when you show up, you bring the spiritual gifts He has given you and the comfort you yourself have experienced in Him (2 Corinthians 1:4). “No one has even seen God; if we love one another, God abides in us and his love is perfected in us. By this we know that we abide in him and he in us, because he has given us of his Spirit” (1 John 4:12). Remember how the Apostle Paul instructed “older women” to “teach what is good, and so train the young women to love their husbands and children” (Titus 2:4)? Did you catch that this has to be trained? Loving our husbands and our children doesn’t come naturally to any mom or wife, no matter how it seems. I’m convinced this is the unique ministry moms and wives have to each other. Our usefulness to each other doesn’t begin when we’ve got it all figured out or when we stop struggling. It doesn’t even depend on whether we’re naturally very compatible with each other. The Gospel makes the body of Christ incredibly flexible and inclusive of all kinds of personalities, backgrounds, ages, and eccentricities. Our usefulness begins when we let God’s grace first transform us and then our relationships. “Beloved, if God so loved us, we also ought to love one another” (1 John 1:11). And today I’m sharing just one more way you can encourage a mom in your life. 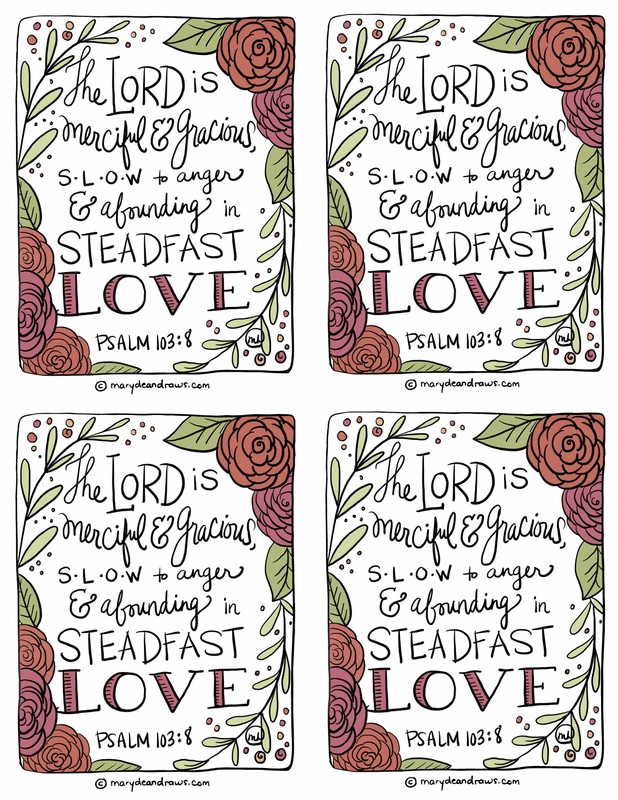 I’m sharing these fun Bible verse cards that you can print and give away. The cards come four to an 8.5x11” page. You can check out more printables from Marydean Draws at the JellyTelly Shop! Scriptures are from the ESV version. *I'm so happy for you to enjoy my printables for your personal (not commercial) use! Use for Bible studies, church groups or events, and Sunday school classes are all fine! If you're in doubt, I'm happy to answer any questions. All artwork and photos are copyright Marydean Draws. If you share this, you're awesome (! ), and as a courtesy, please link back to this post and not the PDF file. Mary is a former ESL teacher turned homemaker, homeschooler, and mom to three. Most days you can find her in her PJs asking for the whereabouts of the two-year-old, trying to make someone do their math, and finishing up a cup of cold coffee. 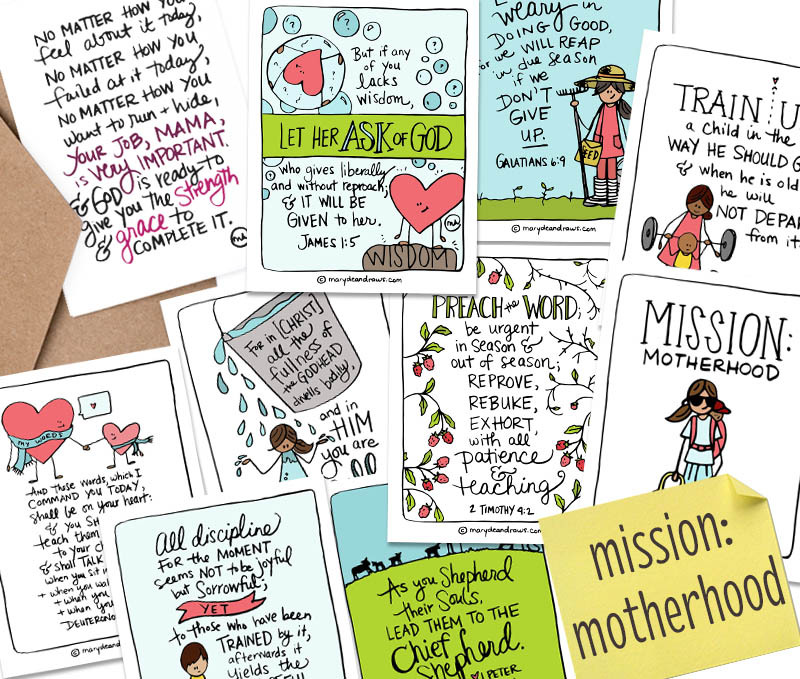 In small gaps of time, she's also a blogger and artist who attempts to capture small nuggets of truth and grace found in God's Word and share them with others through word and printable Bible verse art. She blogs at www.marydeandraws.com. Shop Marydean Draws at the JellyTelly Store!